Please refer to our stock # B-11 when inquiring. 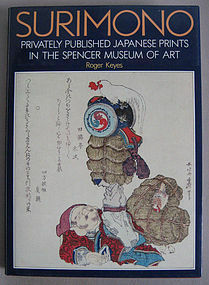 "Surimono: Privately Published Japanese Prints in the Spencer Museum of Art" by Roger Keyes. 1984 First Edition, Kodansha. Clothbound Hardcover with Original Dust Jacket. Condition - New. 199 pages, 60 color plates, 186 B/W reproductions, entries on 268 images, and a comprehensive bibliography. "Keyes focuses on the collaboration between artists and poets. In delightful essays on sixty prints, he draws upon his extensive familiarity with history and legends, language and literature, customs and culture, to reveal the fascination of a forgotten art."